Brian Halligan of HubSpot fame is a very interesting guy that’s figured out how to give off a genuine, yet passionate vibe. Perhaps his ‘it’s just me’ vibe comes from early success in business blended with a long-time following of the iconic Grateful Dead. He’s not a hippy by any means – I mean he’s from Boston, so that’s not in his DNA. The Grateful Dead were known for their unique eclectic songwriting which fused elements of rock, folk music,bluegrass, blues, country, and jazz into improvisational masterpieces on stage. 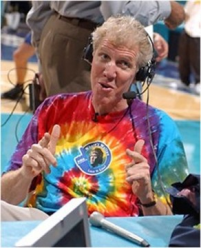 Halligan’s book “Marketing Lessons from the Grateful Dead”, contains a forward by baskeball legend Bill Walton (who also is noted as one of the biggest ‘Deadheads’ ever, having attended over 750 concerts in his lifetime). WOW! I happened to have also met Bill Walton before and can tell you that he too is a very relaxed guy. Really easy to talk to. Being comfortable in your own skin is actually a lesson we can learn for business an marketing. Be real, and be honest to your customers and they’ll come back for more. Today’s customers see through the ‘pitch’. So just be honest and just tell them what you can do for them. Reach out to them where they consume content. Brian shared in his talk to the LinkedOC crowd that THE MARKETING PLAYBOOK all marketers have relied upon for years is broken. We are blasting past TV commercials, tossing brochures, reading news online, deleting spam mail, and not answering a land line phone as we gravitate toward the CONTENT we actually want to consume. Disney appeared in Brian’s presentation as he paid homage to the ultimate content creator. They are busy! Disney has their hands in nearly everything we consume throughout our entire lives. And now so does Amazon and Google. And what has put Amazon and Google on Brian’s radar? It’s the fact that they are tracking our online moves so well. This allows them to be really good at giving CONTEXT to our content. Sorta freaky that they actually know I’ve been looking for new golf shoes. HubSpot tries to take this a step further and help you create context sensitive content that keeps people moving the right direction in your sales funnel. Remembering who visits your site and what they were interested in when they were there; it all takes special software behind the scenes to do this gracefully. HubSpot is working hard to make this happen. When you are ready to put some real content out there on your own website or social media, let me know. Let’s build your online presence this week. For a firehose of marketing content check out HubSpot’s library or their HubSpot Academy for a webinar.